Chris Harris gets behind the wheel of the 3 most desirable super cars this year and drove them on the track to see which is the “King”. Is the Nissan GT-R really good as people say it is?, is it better than the Legendary Porsche 911 GT3?, or does the new V-8 in the M3 have to say something. I personally don't understand why the GT-R is being compared to the M3, why would they compare the M3(low 4 second car) to the GT-R(low 3 second car). They should be comparing it to the Ferrari Enzo and Porsche Carrera GT, but personally i would take the M3 over them all anyways. 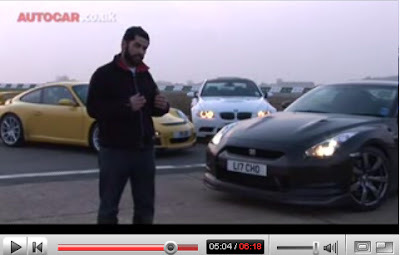 Watch the video to see who won Autocar’s comparison test.